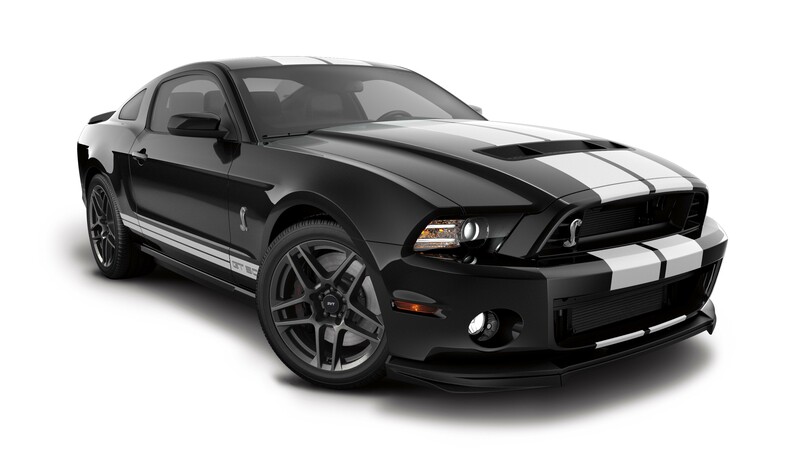 A lot – and we do mean a LOT – has been said about the 2013 Ford Mustang Shelby GT500. But we have to assume all the roars of approval and expressions of delight occurred only after a moment of jaw-dropping, awe-struck silence. Because this pony car truly is unbelievable. With its 5.8 liter supercharged aluminun block V8 engine, 662 horsepower (yes, you read that right) and 600 lb. ft. of torque, the 2013 Mustang Shelby GT500 is the most powerful production V8 in the world. Ford brags it can shoot from 0-60 in 4 seconds in first gear and reach tops speeds of 200+ mph! The Blue Oval ain’t kidding when it brags it’s latest super snake is “coiled and ready to strike”. But don’t take our word for it. Here’s a sampling of 2013 Ford Mustang Shelby GT500 reviews from around the automotive universe. “Ford… creates its beastliest Mustang ever… We weren’t prepared for the 650 hp and 600 lb-ft of torque announced as the car debuts at the Los Angeles auto show. Is that ‘God Bless America’ we hear? The SVT team took the 2013 Shelby GT500 out to The Nardo Ring in Southern Italy in June 2011 for a top speed test.